Not happy with the hand you’ve been dealt? Stack the deck with the Grateful Dead Tie-Dye Playing Cards! Measuring approximately 2 1/2-inches x 3 1/2-inches with a linen type finish, these cards are great for professional players and fans! Ages 8 and up. 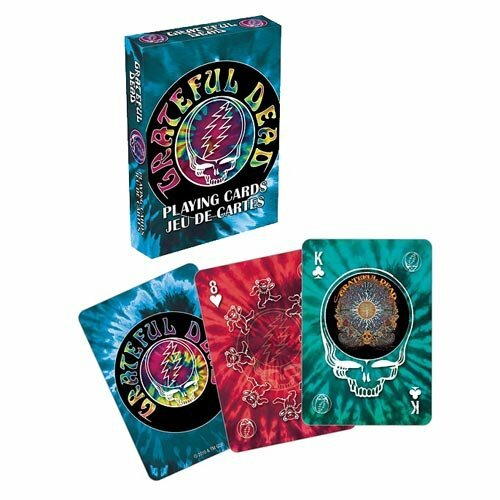 The Grateful Dead Tie-Dye Playing Cards can be delivered to the UK, Ireland and Overseas. All the products we sell are authentic and we want you to be fully satisfied with every purchase you make. If the item you receive is not suitable for whatever reason, you can return it within 30 days and you will promptly receive a refund or it can be exchanged for a different item of your choice.